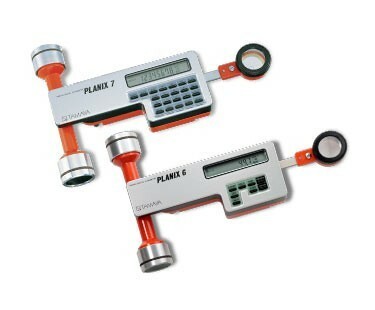 The Planix 6 has an 8-digit readout and operates up to 30 continuous hours using a rechargeable NiCad battery. Its features include selectable English or Metric scales, multiple measurement averaging, display hold, accumulative measurement, and electronic zero reset. A battery power saving provision automatically turns off the instrument when left inactive for more than three minutes. The Planix 7 offers all of the features of the Planix 6, plus display of areas directly in terms of square centimeter, meters, inches, feet, or acres, plus provision for input of different X and Y scale factors.